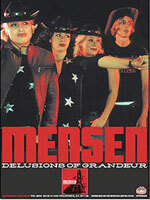 Hailing from the same rock and roll Mecca that brought the world Turbonegro and Gluecifer, Oslo Norway's MENSEN are 3 girls, Maryanne (guitar/vocals) Christine 16 (lead guitar) and the mysterious Tiny (aka Power Plingus on drums) and the luckiest boy in the world, Lars Fox on bass. 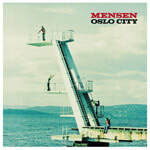 In their four years as a band, Mensen have managed to capture the attention of the leaders of the Scandinavian rock scene such as The Turpentines, Hellride and the Hellacopters, who often insist on Mensen opening up their shows. Obviously influenced by Girlschool and The Runaways, the girls (and boy) also list everyone from The Dead Boys to Dead Moon as inspiration, but the ever present "If we wouldn't have started this band, we would have gone insane" vibe runs throughout their music as well. It's desperate, intense, and bombastic, but somehow manages to be a lot of fun. 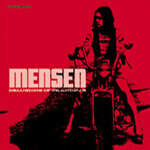 After all, Mensen is the Norwegian word for menstruation, so you have to expect some ups and downs along the way!